Programme Advisor Heidi has travelled far and wide and spends most of her time talking to potential volunteers about the destinations and voluntary placements that Projects Abroad offers. Earlier this year, Heidi decided to take her 6 year old son, Rupert, to volunteer in Sri Lanka. I caught up with her to find out what they got up to. Why did you choose to volunteer with your son? I have travelled all over the world and volunteered in several countries, such as Borneo, Fiji and Ethiopia. I was keen to share this sort of experience with my son and at the same time visit a country that was new to me. I wanted to take time out from our life together at home, explore a completely different way of life, and take the opportunity to learn about a new culture. I was also interested to see how he would react and cope with working at grass roots level, without his usual home comforts. Safety was my primary concern and reason for choosing Sri Lanka. I had read and heard from others that Sri Lankans are the kindest people in the world and very family-orientated. I thought this would make for a soft landing for a 6 year old. Rupert also adores wildlife so the chance for him to see elephants and possibly even tigers in the wild also played a big part in my choosing Sri Lanka as a volunteering destination. What was it like travelling with your son? I have travelled long-haul with Rupert before and therefore wasn’t too worried about how he would cope on the flight. He ended up sleeping for the entire outbound journey, but stayed awake watching films on the return leg. My advice to parents thinking of volunteering abroad with a young child would be to choose a good airline. Don’t underestimate the value of having an independent entertainment system fixed to the back of the seat in front and don’t take it for granted that every airline has one – some do not! The ability to choose and watch films makes a long journey go so much quicker – especially for a small child. I flew with Qatar Airways and they went out of their way to make my journey as stress-free as possible. I was fast-tracked on to the plane because I had Rupert with me and on every leg of our journey he was given little gifts, such as colouring books, to keep him occupied and entertained. What was Sri Lanka like? Sri Lanka is a fantastic country in which to volunteer as a family. Sri Lankans are the kindest, most warm-hearted people I have encountered in over 25 years of travelling in developing countries. They like to show that they have got taste, class and wealth. Every tuk tuk driver wants to take you to see their family and they do not expect anything for their hospitality – they just want your company and to learn about your culture. They like having you in their environment and are keen to have their photo taken with you to show to the rest of their family. We visited Sri Lanka in April and had fantastic weather each day. In the late afternoons the heavens opened and unleashed the most ferocious and exciting storms I have ever experienced. They lasted for approximately one hour and by morning the ground was dry again. The local food was delicious and, contrary to popular belief, not necessarily spicy, although you can of course opt for spice if you prefer. The flavours will blow your mind – plenty of cumin, mustard seed, coriander, cinnamon, turmeric, chilli and coconut. I found it to be the perfect mix of Malay and Indian cuisine. Rupert and I were based in Wadduwa, a small town on the coast. It’s a very pleasant little town and our accommodation was just a minute’s walk from the beach and a five minute tuk tuk ride to the town. There were not many restaurants nearby, but this didn’t bother us as the food cooked by our hosts was perfect. They went to market every day to buy fresh food for us and exceeded all expectations. It was a pleasure to eat there. Sri Lankans do not use cutlery. Instead you must wash your hands before sitting down for dinner, use your left hand to serve and your right to eat with. This can take a bit of getting used to but we were taught by our local hosts and Rupert soon mastered it. It actually took quite a while to get him using a knife and fork again after we had returned home. What did you do in Sri Lanka? The main reason for our visit to Sri Lanka was to take part in some volunteer work. During the week we spent our days at a local school and care centre where we taught a group of twenty or so 3-5 year olds. As the children were so young, we focussed primarily on teaching them the alphabet, numbers, colours and animals. We also incorporated plenty of arts and crafts into our lessons. The children were so keen to learn and seemed to particularly enjoy the time devoted to painting. During lunch breaks we spent time with the children outside, pushing them on the swings, helping them climb trees and playing hop scotch. Rupert was in his element. On our first day one of the teachers took him to buy fabric, which was then cut and stitched into traditional pyjamas for him. He then stood in front of the class and sang an English nursery rhyme to the children before teaching them how to recite it back. He made sure he shared his attention with the entire class, moving from table to table in order to spend time with every child. He got involved in all of the arts and crafts lessons and helped me teach the children basic English and numeracy. What did you do in your free time? I wanted to throw myself into the local culture so attended Buddhism lessons with a monk. Once I had been taught the basics I began to meditate with him. This was very much about karma and felt quite spiritual. I was extremely honoured when, one day, a local gave me his grandfather’s books on Buddhism as a gift. The book was over 50 years old and explained in detail the Buddhist terminology. We also saw a huge variety of wildlife during our stay, from monkeys and iguanas to exotic birds and huge pythons. Rupert was desperate to see an elephant during our stay in Sri Lanka. I had read about the use of elephants in the tourist industry and so chose to visit an elephant sanctuary. Whilst the elephants at the sanctuary did appear to be in good condition, I was upset to see the infants separated from their mothers simply to give tourists the opportunity to bottle feed them. I was also shocked when staff at the sanctuary tried to encourage me to ride an elephant – which I refused. Rupert and I later went on safari to see elephants in the wild and, whilst they were harder to spot, we far preferred this experience. In total, our trip to see the elephants took about 10 hours and we travelled the whole way by tuk tuk. The best bit of advice I can give to any family volunteering is get to know your driver and ask for a price beforehand. Even when language is a barrier, there really is no need to take a car so long as your tuk tuk driver is registered and insured. Our driver, Naual, stayed with us for the whole day and on the way back from the elephant sanctuary took us to see several rivers and the construction of the new highway. He made sure we weren’t overcharged in shops and ordered us some incredible Sri Lankan food in a café that we stopped at. We ate so much that we had to decline dinner that evening! 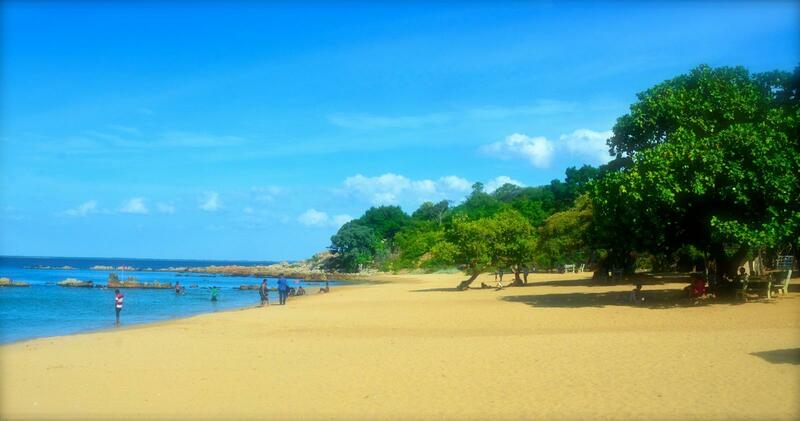 What did you achieve during your time in Sri Lanka? As a mother I can honestly say it is the best thing I have ever done. At home we are so busy with school, work and everyday life that we do not realise how much time we miss out on with our children. Watching my son interact with the local children, assist them with their learning and grow in confidence was inspirational. For 3 weeks Rupert survived with no TV, no computers and no tablets. He just worked with the children, enjoyed the wildlife and learnt about the local culture. He was taught to play cricket and badminton and even tried his hand at yoga. He is as keen to continue these activities back in the UK as I am to continue pursuing meditation. At no point did he ask about watching television or playing on the computer – he simply appreciated his surroundings. We both feel like we have learnt a lot more about each other. The children we were working with obviously enjoyed the interaction with western people. All of the teachers there were local volunteers and they were only too happy to take a break and let us lead the class. We bought a few resources (pens, crayons, books) with us from the UK which the children were thrilled with. The local children were fascinated by Rupert and constantly wanted his attention. They enjoyed seeing how a little boy from a different country works and plays and were eager to learn more about him. The only thing I would change would be the length of our stay. 3 weeks in Sri Lanka was not nearly long enough to do and experience everything we wanted. Neither of us were ready to leave! What advice would you give to future families thinking of volunteering abroad together? Just do it. I plan on taking Rupert volunteering with me every year until he is old enough to travel without mum. It was by far the most pleasing experience of my life and he has come back with a new found respect and understanding of a culture very different to his own. He is now even more confident than he was before with amazing stories to tell the other children at school. He has even been invited by the headmaster of his school to present our volunteer experience to the teachers, parents and children of his year 2 class. I could very easily return to Sri Lanka and Rupert would be happy to do so too. I am also considering Bolivia as a destination. This would be a new continent for Rupert and a new country for the both of us. Bolivia is famous for its dramatic scenery but it is also the poorest country in South America and desperately in need of volunteers.